Mountain bikes and bicycles can be a pricey investment especially if they are not kept in safe, sheltered environment when not in use. Bike sheds are the easiest way to protect and ensure your bike is in it's peak condition, rust free. Finding a universal bike storage shed that has just enough room for a bike and other important belongs is easy and affordable as well. Bike storage is increasingly important during the Winter months. When a bike is left out in extreme weather conditions, it's life is drastically cut short, causing an expense to fix or replace the entire bike itself. This problem can be eliminated by simply storing these bikes in a cool dry place such as a shed or storage unit. If size of storage or shed is the problem, consider a bike shed. It takes up less space and has the same great features that are required to protect and shelter.. 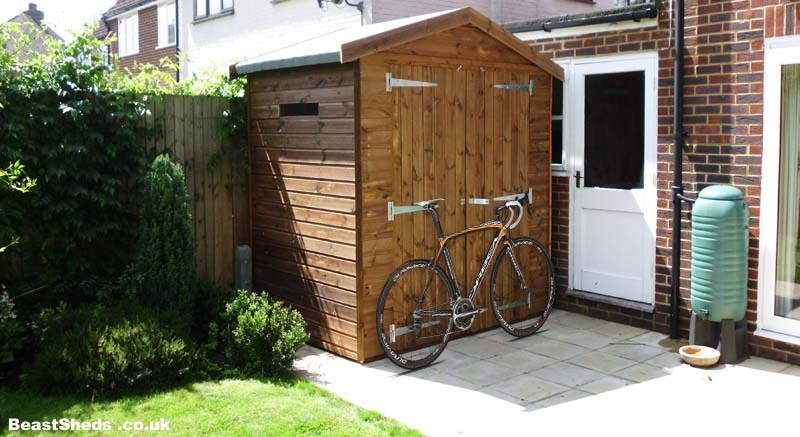 Beast sheds make bespoke wooden bike sheds ideal to store your bicycles. We reverse the standard Apex layout so the longer side is the one with the door on. So a usual bike shed design is wide but not overly deep, with double doors and possibly a security window (or none at all). You can be sure our bike sheds will keep your valuable pedal-driven recreational vehicles safe and secure! From the above diagram you can see how the normal apex layout's sides (A & B) have been swapped. So the longer side (A) is now the one with the door.